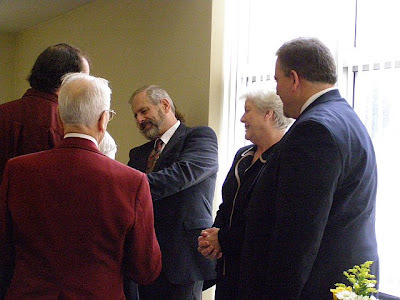 Pastor Larry Weber and Nancy Weber (center) greet worshipers at the 100th Anniversary Renascence of the Waynesboro, Pa., Grace Brethren Church this past weekend. Pastor Larry Orme, Renascence guest speaker, is on the right. The Grace Brethren Church of Waynesboro, Pa., celebrated its 100th Anniversary Renascence April 11-13, 2008. Pastor Larry Orme, Executive Pastor of the Penn Valley Grace Brethren Church, Telford, PA, was the conference speaker. A Saturday Evening concert by Seasoned Grace, a ten-member musical ensemble founded and directed by Pastor Larry Weber of Waynesboro, involved the audience in singing as they listened to beloved and familiar hymns. Sunday afternoon, April 13, a special service of worship and celebration featured a message by Pastor Orme, with inspired singing led by a brass choir, organist Nancy Messner (sister of Pastor Larry Weber) from Fairlawn, OH, and soprano soloist Judy Chenoweth, of Hartville, OH, both of whom are members of Seasoned Grace. Messages of congratulations from Tom Avey, Fellowship Coordinator of FGBC, and Ed Lewis, Executive Director of CENational, were read to the congregation. Messages from local political leaders, missionaries, and other churches were read, as well. The Waynesboro church is committed to a growing ministry. It has purchased ten acres, and is actively in negotiations for the sale of the current church property which will enable the church to relocate to a strategic position just west of the community. Pray for the details of the sale and eventual construction of a new church building for the glory of Jesus Christ. All praise is to Him for His blessing and leading the Waynesboro church into a second century of ministry.